The Great Dane is a sweet tempered dog is known for being the tallest breed of dog. The Great Dane is the tallest dog breed. But this is a sweet, affectionate dog and so has earned the common name of Gentle Giant. There is some contravery about where this large dog breed originated. Some say it is a German Great Dane and other suggest it possibly originated Denmark. Other common names, reflecting both countries, are the German Mastiff, which in German is Deutsche Dogge, and the Danish Hound, which in German is Danischer Hund. This large dog is affectionate and loves the company of humans. It does do well with kids, but good training is important to keep it from getting too rambunctious with very small children. The Great Dane's bravery and large size make it an excellent watchdog, and it rarely barks without good reason. When selecting a Great Dane, look for family history of hip dysplasia and heart problems. It is said that Great Danes that are white near its eyes will be blind, and those with white near their ears will be deaf. 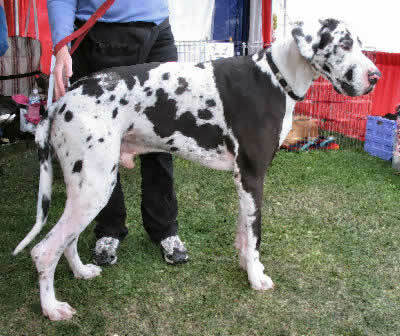 Breed Type A working breed, the Great Dane is known for being the tallest breed of dog. The Great Dane is a popular guard dog, but it is gentle enough to be a family pet. Background The Great Dane's roots go back to Ancient Egypt, Greece and Rome. Its ancestors purportedly include the Mastiff, the Irish wolfhound and the Bullenbeisser. There is much debate as to whether the breed originated in Denmark or Germany. Popular Great Dane hybrids include the Daniff (Great Dane and Mastiff mix) and the Labradane (Great Dane and Labrador mix). Description The Great Dane is a large, muscular dog. Standard colors of its short, thick coat include fawn, brindle, black, blue, and harlequin. Eye color varies with coat color. Ears are medium length, and may or may not be cropped. The head is narrow with a long muzzle. Males are 30-34 inches tall and weigh 120-200 pounds. Females are 28-32 inches tall and weigh 100-130 pounds. Care and Feeding The Great Dane's diet should include beef, oats, rye, and potato. Great Danes should be brushed and combed regularly, and should be dry shampooed as needed. Nails should be trimmed. The Great Dane's ears may or may not be cropped as a puppy. Great Danes shed moderately. Regular vacuuming is important if they are to be kept indoors. Housing Your Dog Great Danes do surprisingly well in small spaces as long as they get sufficient exercise. It is best if they have a large outdoor space to play in. Social Behaviors The Great Dane does well with children, but obedience training is crucial to prevent them from getting too rambunctious with small ones. The breed does well with other dogs if properly socialized when young. Handling and Training Training can be somewhat difficult with the Great Dane. Positive reinforcement, however, is usually effective. Activities Great Danes need lots of exercise. Daily walks are essential, and regular play sessions are advisable. Breeding/Reproduction When selecting a mate for your Great Dane, check bloodlines for hip dysplasia, tumors, and heart disease. Common Health Problems Great Danes are prone to hip dysplasia, tumors, and tail injuries. Bloat is also rather common, but it is largely preventable with proper feeding and exercise practices. Availability Great Danes are reasonably easy to find. Prices are often in excess of $1,000. We just adopted a Mastiff/Great Dane mix.we did a 2 week trial time and he weighed 92 pounds and 2 weeks later he is 96 pounds.He is only a year and a half old. He has a couple things we need to work on like barking and protecting us from those mean killer bunnies and squirrels in our back yard. He chases them with me attached! He is a wonderful addition to our family. I have a Great Daniff (Mastiff/Dane). He is 10 months and a huge lap dog. He is 140 lbs. and still growing. As for temperment, he is the greatest giant baby anyone could ask for. They require a lot of attention and love, so if you are not prepared to devote your time to the breeds...don't buy one. For those who choose them...they are perfect family pets if trained properly. My four year old son is obsessed with the cartoon Scooby-Doo, so my husband and I were going to look for him a great dane for christmas when one of our friends called us and said that they had found a dog wandering their street. We went out and looked at him and it was a 10 month old daniff puppy, naturally our son fell in love with him and named him Scooby-Doo...we have had him for almost a year now and he is like my son. We have two kids a 4 yr old and a 2 yr old, and they absolutely love him to death. He is so much a part of our family, we couldn't have asked for a better dog. He is so gentle and so protective of the family. He is just a wonderful breed. I don't have to worry about the kids when they are outside b/c Scooby doesn't let anyone he doesn't know near the kids and he keeps an eye on them. I would strongly suggest to any family that a daniff is 100% a perfect family dog. You will not make a mistake going with this breed!